McNaughtan’s Bookshop is the oldest secondhand and antiquarian bookshop in Scotland, and the only shop in Edinburgh with full membership of the Antiquarian Booksellers Association. 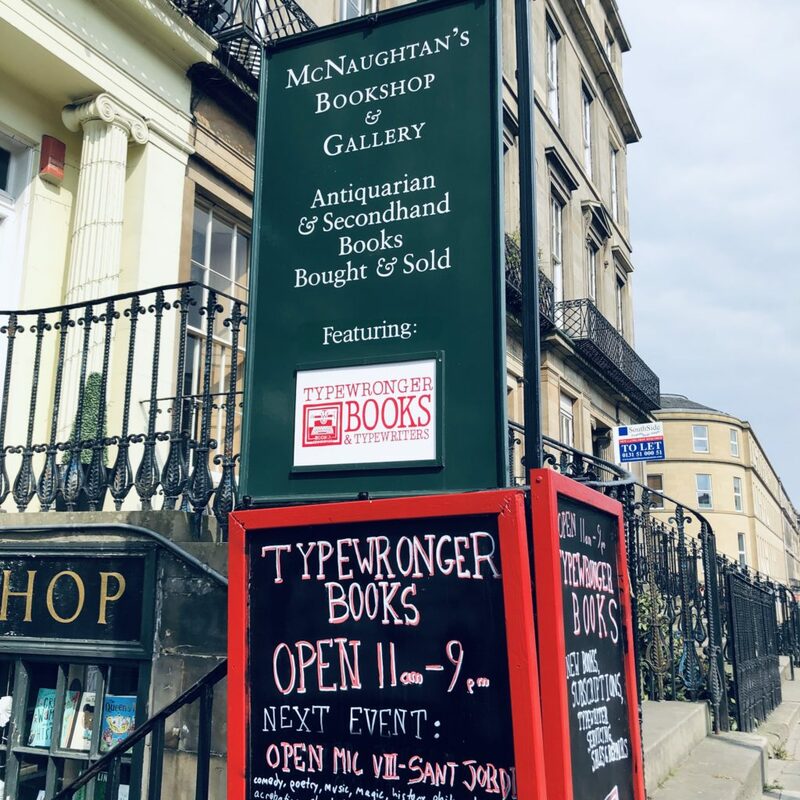 Typewronger Books is Edinburgh’s newest indie bookshop & publisher, and Scotland’s only typewriter shop. McNaughtan’s & Typewronger operate on the same premises and are looking for an employee to work full time, split between the two businesses. This is an ideal position for someone keen to develop experience with the ins & outs of bookselling across its entire range, from brand new releases and indie publications to secondhand, rare, collectable, and antiquarian books. The right candidate will understand that, as often in small businesses, there are a wide variety of roles essential to the job. These will range from sweeping steps, cleaning & tidying shelves, and packing customer orders all the way up to customer service, meeting brand reps, organizing publication & printing projects, running events, and handling & researching antiquarian and collectable books. This is an entry-level position but with very considerable room to grow in duties and responsibilities. The right candidate will be able to chat at ease with any customer of any background. Typewronger is a talking shop where conversation is key. McNaughtan’s is quieter, but with the highest level of personal service in specialist areas. Confidence and kindness, and a good whack of joie de vivre are vital. Candidates should be readers, not only of classics but contemporary work, and demonstrate a knowledge and desire to learn more about publishers, authors, and all sides of the book business, both historical and contemporary. Bookshops carry a wider range of unique stock items than any other business of comparable size, and secondhand and collectable books add consideration of condition, edition, issue point, etc. Being able to pick up and notice these details is of prime importance. As with any modern business, use of Word, Excel, and various specialized applications (in this case stock management systems, publisher’s programs, desktop publishing and photo-editing software) are a regular part of the job.